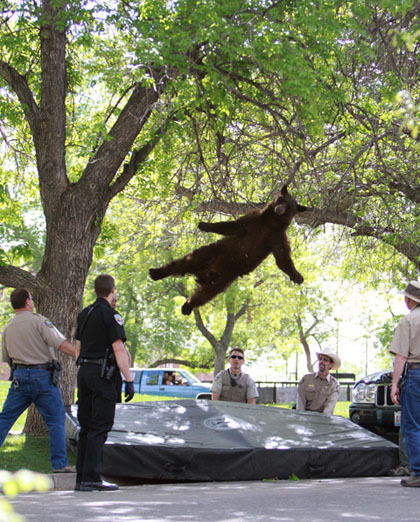 I saw this rather amazing pic in the dead tree Denver Post this morning. A black bear wandered on to the University of Colorado campus in Boulder and wildlife officials had to tranquilize him to remove him safely. As you can see they put out a nice soft mat for him when he passed out and fell out of the tree. Incredible photo! Lots of fuuny captions could apply(This seems like a Yogi Bear type scenario to me....) This reminds me of an incident, so I have to tell a funny(and embarrassing) bear invasion tale here....Years ago, when I was living near Asheville, N. C., a city in the western mountains of N. C. that sees it's share of black bear "invasions", a lady living in the city limits called to report a black bear in a tree in her yard. Though it was already after dark, the wildlife officers that handled such incidents quickly responded. It was very dark, rainy and windy, and VERY HARD to clearly see the bear up in the top of the tree--but a little movement was detected if one looked closely enough at the big, black blob. A tranquilizing dart was sent into it's rump--no reaction or response. After a long while, another dart was risked--STILL no response. After another long wait, it was finally discovered that the creature in the tree was NOT a black bear after all, but a black plastic trash bag that had blown up in the tree! ......or maybe this one--"Bear runs amuck in local Helium factory; Campers' elevated caches no longer secure"--now THAT'S something Yogi would definetely try if he thought of it! And as usual, Boo-Boo would NOT approve!